Why aren’t we building more homes? This has been the perennial question in housing policy, as initiative after initiative seems to have made too little headway. But, as Daniel Bentley explains in this new guide to the housing crisis, the challenge is not just to increase the number of new homes, but to ensure the right ones are built in the right places. The barrier to this lies where few policymakers have cared to look in recent decades – in the trade in land. While much of the focus of recent reforms has been on increasing the amount of land that is approved for housing development, little consideration has been given to ensuring that it is then used in the best interests of the community. This has been a major oversight, as development land is being traded at values that too often require a slow drip-feed of desperately-needed new homes, or prevent affordable housing commitments from being honoured in full. Together with the under-utilisation of sites that could be used for new housing, these are the consequences of allowing monopolistic landowners to extract too high a price from new developments. Not only is this process detrimental to the community, but the windfall gains that landowners are collecting in the process – often running to millions of pounds per hectare – are unearned. As the classical economists knew, the increase in the value of land owing to its location is the product of the labour and the investment of the community, not the individual landowner. 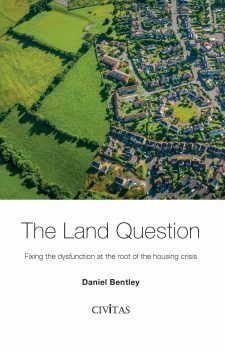 Here, Bentley argues that we need to revisit the land question and design a new framework to ensure that sites for new housing are brought forward in the quantities and at the prices that are compatible with the country’s housing needs today. Only by reforming the land market, and rewiring incentives for landowners, can we hope to build the homes we need in the places we need them.